Roman’s owner, Mary, wrote to me yesterday, with several questions and let me know that links to his photos weren’t working. I really appreciate this. Please do let me know when something isn’t working! At Julie’s request, I redid Roman’s ‘postcard’ in the Galleries section, but neglected to relink it to his pedigree and collage page. It may have taken me a long time to realize this oversight without Mary’s input. Thanks again! 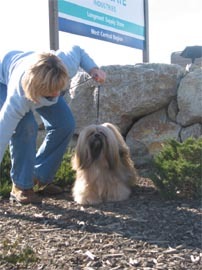 Mary asked about the dog on the home page, blowing in the wind, on the rocks. That’s Seth, Ch. FFT It’s Five O’clock Somewhere. Seth is Roman’s sire. That photo was taken by Faye, the day Seth completed his Championship. Julie was in Colorado too. I had something else going at the show site…and asked them to please do a photo session. While that photo looks like he’s high on a mountain top, he’s actually in front of a rock wall at a gas station! With rare exception, all the photos and artwork is of our dogs. Feel free to inquire about any of them! Hello Mary, I own Roadie. Seth is his father. Roadie looks exactly like Seth in color. I am spoiling him. He understands what I say to him and I understand his different barks and what they mean. He is a joy. Alma, looks like Roadie enjoys his “after Champion life” from the pictures. It’s fun to see the siblings, half siblings and compare personalities. I think this line of Lhasas has quite a fun and happy tempermant. We just finished watching Roman’s favorite movie, “Eight Below” about an Antartica sled dog adventure; he watches, barks, runs to the tv, and does his “wave” to the screen. I have to make him take his seat on the couch when he starts pushing the tv. His other favorite show is Merkat Manor, the adventures of a small rodent on Animal Planet. My other Lhasa, Taz, only cares about the intermission snacks and preserving his spot on the couch. Take care–enjoy your Roadie!